Note: We also use the term radius to refer to the length of the radius and diameter as the length of the diameter. Now that we have reviewed the basic terminologies, let us have some examples on how to calculate the area of a circle. What is the area of a circle with radius 8 centimeters. Use . Be Careful! Length is measured in units and area is measured in square units. For example, the radius given is in inches (length), the answer for area is in square inches. So, since the Civil Service Exam is multiple choice, the examiner could place units and square units in the choices. Find the area of a circle with diameter 14 centimeters. Use . Notice that the given is the diameter, so we find the radius. Since the diameter is twice its radius, we divide 14 centimeters by 2 giving us 7 centimeters as the radius. Now, let’s calculate the area. Find the radius of a circle with area 6.28 square meters. Use . In this problem, area is given. We are looking for the radius. We still use the original formula and make algebraic manipulations later, so we don’t have to memorize a lot of formulas. We substitute the value of area and . We are looking for , so we isolate to the right side (recall how to solve equations). So, radius is square root of 2 meters or about 1.41 meters. In this calculation, 2 is not a perfect square. Since you are not allowed to use calculator, they probably won’t let you calculate for the square root of number. So, in this case, the final answer is that the radius of the circle is square root of 2 meters (meters, not square meters). That’s all for now. 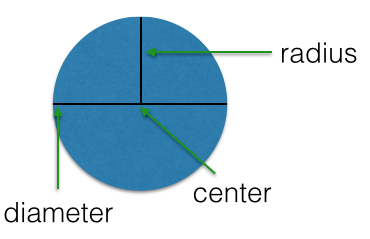 In the next post, we will be working on problems involving area of a circle.